The Insulin Ultra-Sensitive kit is designed for the quantification of insulin in low-concentration samples of cell supernatant. An excellent tool in diabetes research. One hurdle faced by researchers seeking to quantify insulin is the high number of islets often required per assay. Designed for enhanced sensitivity, this kit is intended for the quantification of insulin in low-concentration samples. The kit is ideal for the detection of basal insulin levels and insulin released from mouse pancreatic islets. Insulin is measured using a sandwich immunoassay of two monoclonal antibodies, one labelled with Cryptate (donor) and the other with XL665 (acceptor). The intensity of the FRET signal obtained is proportional to the concentration of insulin in the sample. 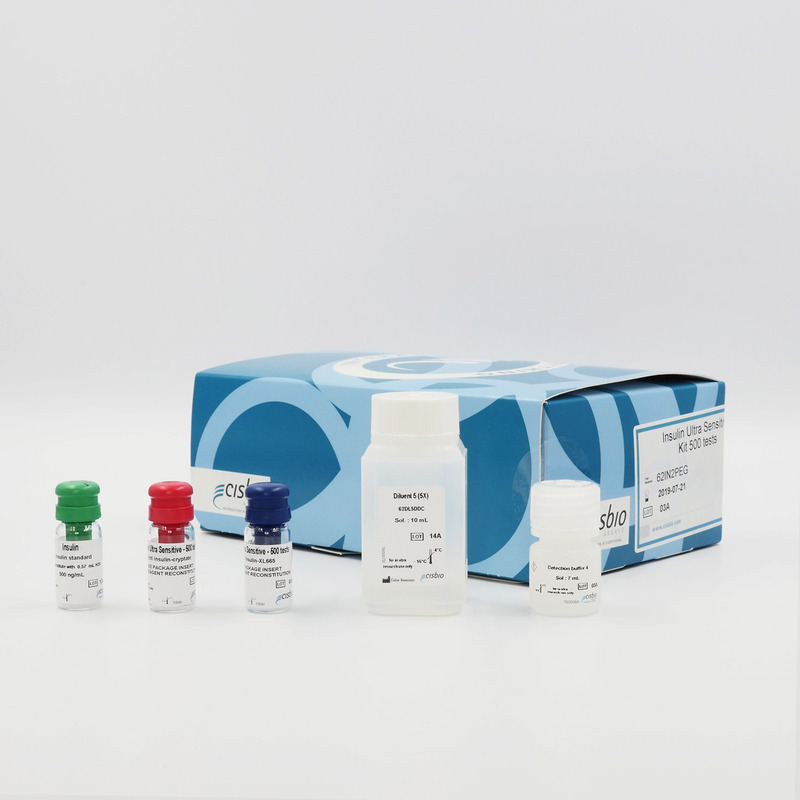 10 µL of cell supernatants are supplemented with 5 µL of acceptor-labelled antibodies and 5 µL of donor-labelled antibodies (or 10 µL of pre-mixed reagents for a single dispensing step). The mix is then incubated from 4h to overnight at RT and results are read on an HTRF compatible reader. The HTRF Ultra Sensitive insulin assay showed an excellent correlation to the leading RIA on mouse pancreatic islet supernatants. With a slope of 0.946, the regression line was close to the ideal line, demonstrating the assay's reliability. Pancreatic islets were isolated from C57BL/6N male mice. The islets were dispensed into tubes with KRB buffer containing either 2.8 mM or 16.7 mM glucose (5 islets/tube, 6 tubes/condition). After 10 minutes or 30 minutes of incubation, the supernatants* were collected and the insulin concentrations measured using the HTRF Ultra-sensitive insulin kit reagents. ​*Samples were kindly provided by S. Dalle and M. Ravier’s research team: Physiopathology of pancreatic beta-cells, Institute for Functional Genomics (IGF), Montpellier, France.